The 4 new Zarlab Ph.Ds: Nick Furlotte, Jae Hoon Sul, Emrah Kostem, and Eun Yong Kang. A big congratulations to the 4 members of the group who were hooded at the graduation ceremony in Pauley Pavilion on Saturday. 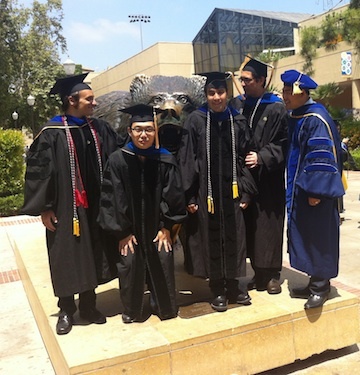 The 4 new Ph.D.s are Nick Furlotte, Jae-Hoon Sul, Eun Yong Kang and Emrah Kostem. Dr. Nick Furlotte is heading off to 23andMe and Dr. Emrah Kostem got a great job at Illumina. Both will start in July. Luckily for us, Dr. Eun Yong Kang and Dr. Jae Hoon Sul will stay with us for another year as postdocs. These four are the bulk of the second generation of Ph.D. students in our group. Dr. Dan He graduated last year and is now doing well at IBM Research. The first generation of Zarlab Ph.D. Alumni are doing also doing well. Noah Zaitlen (Ph.D. in 2009), this past fall started a faculty position as an Assistant Professor at UCSF. Hyun Min Kang (Ph.D. in 2009) has been an Assistant Professor at University of Michigan for a few years now. Jimmie (Chun) Ye (Ph.D. in 2010) has been doing well at the Broad Institute of MIT and Harvard and Buhm Han (Ph.D. in 2010) who stayed with us for a few years after his Ph.D. and won the UCLA Chancellor’s Award for Post-Doctoral Research joined Jimmie at the Broad Institute. Sean O’Rourke (Ph.D. in 2009), a semi-pro climber, is the only one who achieved glory outside of academia and set the California 14ner speed record last summer. You can purchase his ebook about his climbing here. A great development in the last year is that even though people graduate and leave the group, that does not mean that we stop working together. The past year Jimmie, Buhm and Dan coauthored several papers with current students in the group(10.1089/cmb.2012.0091),(10.1007/978-3-642-37195-0_7),(10.1016/j.gene.2012.11.093),(10.1534/genetics.113.150169),(10.1093/bioinformatics/bts235)(10.1371/journal.pgen.1003491). We hope to get the other alumni involved this up coming year as well.